DiaTea Cardamom flavor works as much as the same way to counteract digestive problems. Use it to combat nausea, acidity, bloating, gas, heartburn, loss of appetite, constipation, and much more. It helps the body eliminate waste through the kidneys. It has a pleasant aroma and tastes good. 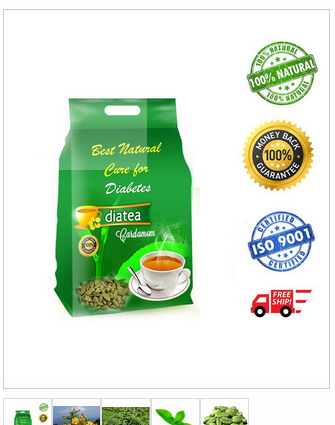 It is an effective supplement for Diabetes mellitus. It helps in controlling blood sugar level and works effectively against insulin resistance and combats the associated metabolic disorders. DiaTea was established in the year 2007. We are the manufacturer, exporter, wholesaler, trader, retailer, supplier, distributor of herbal dia tea, pure organic mountain tea, flavored dia tea. The offered tea is processed by experienced professional using superior quality natural tea leaves and modern technology. This tea is mainly used for weight loss. Further, this tea is available in various quantities packing as per the requirements of the clients at industry leading rates. Being a quality oriented firm, we assure to provide utmost pleasure to the clients by offering them high quality products as per their needs. In order to maintain the optimum quality level throughout the production process, our team of quality controllers strictly examines the entire process and check all the products on several quality parameters. Our principled business policies, client centric approach and competitive price structure have garnered a huge client base all across the country.